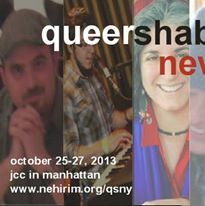 The Nehirim Queer Shabbaton is a weekend of queer Jewish culture, creativity, and community. It brings together about 100 LGBT Jews, friends, family, and bagel chasers, for workshops, services, performance, play, and plenty of time to connect. This year's shabbaton will be directed by Rabbi Debra Kolodny and Jase Schwartz. The cost of the Shabbaton is only about $100, with financial aid available (www.nehirim.org/aid). Housing is on your own -- post here if you're looking for a place or have one to offer!